The Violin Concertos by Uuno Klami (1900-1961) and Einar Englund (1916-1999) are 20th century masterpieces of the violin concerto genre both overshadowed until now by their compatriot Jean Sibelius' hugely popular Violin Concerto. 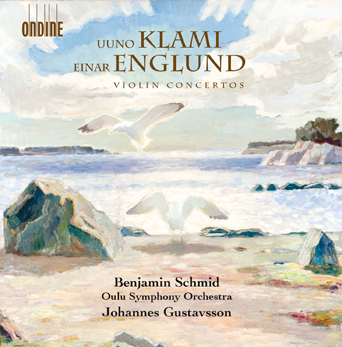 In this recording award-winning violinist Benjamin Schmid gives impressive performances of the two works together with Oulu Symphony Orchestra and their chief conductor Johannes Gustavsson. Uuno Klami wrote his Violin Concerto during the World War II and it was premiered in Stockholm in 1944 by Anja Ignatius, internationally the most celebrated Finnish violinist of the time. The Concerto was lost during the war and the composer completed a new version of the work in 1954. Uuno Klami is known for the strong influences that he took from French music and from the music of Stravinsky, much evident in the works that he wrote during the 1920s, but the violin concerto, however, belongs stylistically into Klami’s later period when the composer became more interested in symphonic textures. Indeed, the critic Erik Tawaststjerna considered the work to be “more symphonice than his symphonies”. Year 2016 marks the centenary of the birth of Einar Englund, one of the most influental voices in Finnish contemporary music during the decades after World War II. Englund was interested in large-scale forms writing 7 Symphonies and numerous concertos. Englund’s post-war works show a mental similarity to the works of Bartók, Shostakovich and Prokofiev. However, during the decades Englund’s style gradually changed towards a more lyrical idiom, well manifested in his Violin Concerto from 1981, one of his most lyrical works. The premiere of the work in Finland was a success but for reasons unknown the work is performed rarely. Known for his exceptionally wide repertoire and a great sense of musicality Benjamin Schmid is one of the most versatile violinists of today. Described as “one of the most valuable of today’s golden-age-violinists” (The New York Sun), Schmid has performed with orchestras such as Wiener Philharmoniker, Philharmonia Orchestra, Royal Concertgebouw, Gewandhausorchester Leipzig, Tonhalle-Orchester Zürich, National Symphony Orchestra Washington, Gulbenkian Orchestra, and Chamber Orchestra of Europe. He is also a sought-after jazz violinist. In 2006 the Strad Magazine wrote: “Schmid mesmerises from his very first entry, shaping phrases with a skin-rippling sensitivity to send the spirits soaring. His golden tone, immaculate intonation, faultless technique and total identification with this magical score are truly things of wonder.” Benjamin Schmid is accompanied by the Oulu Symphony Orchestra and conductor Johannes Gustavsson whose debut recording on Ondine released in 2016 includes works by Icelandic composer Jón Nordal (ODE 1282-2).